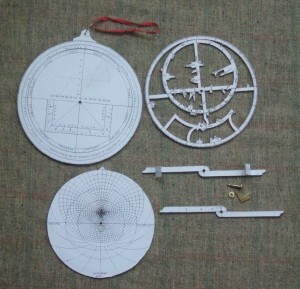 I found Keith’s astrolabe online, which as well as giving you a real-time image of the heavens, also can generate the seperate parts for making up a paper astrolabe. 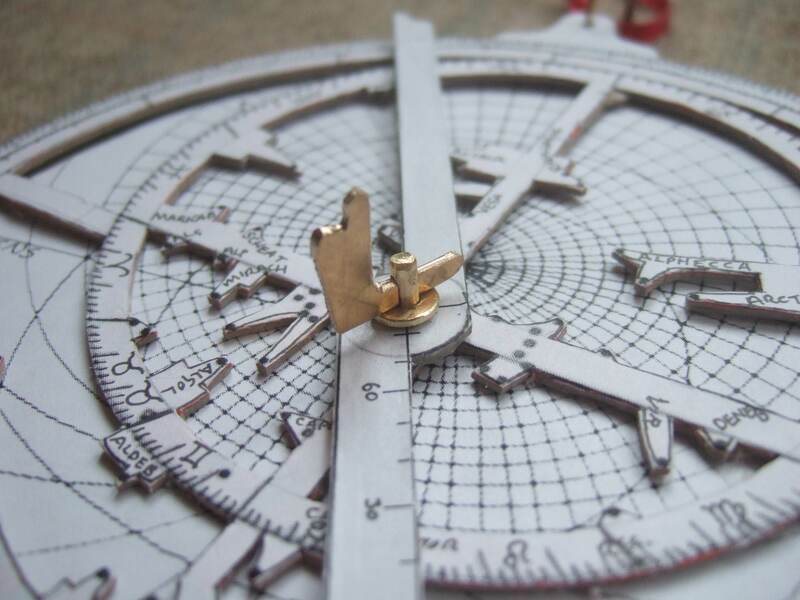 I printed the star map on a transparency and made one up way back in about 2006, though I gave it away and don’t know where it is now. I have long thought of combining the computer-generated lines and data from the programme with a more classic construction technique and yesterday I finally got round to doing that. 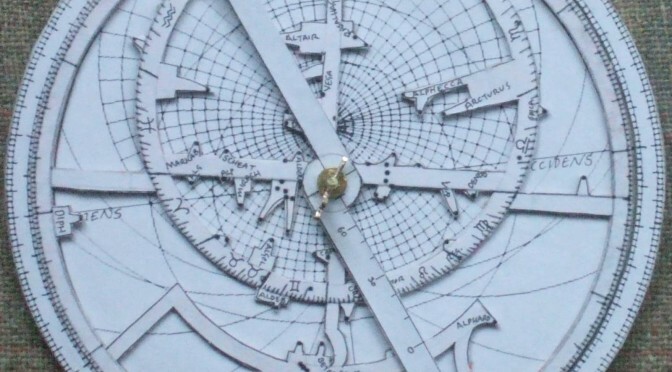 My astrolabe is printed from images generated (and heavily edited) from Keith’s programme, then hand-labelled and retouched, and glued onto pasteboard. I made one plate, with lines on each side for Oxford and St Andrews. I made the pin, washer and horse that holds everything together from brass. I have various thoughts about this having made it up. Surprisingly, it is easier to read with the thick cut-out rete, compared to the ones I have seen that have a rete printed with the stars on a transparent overlay. I think the three-dimensional look helps you to visualise which objects are fixed and which are moving. 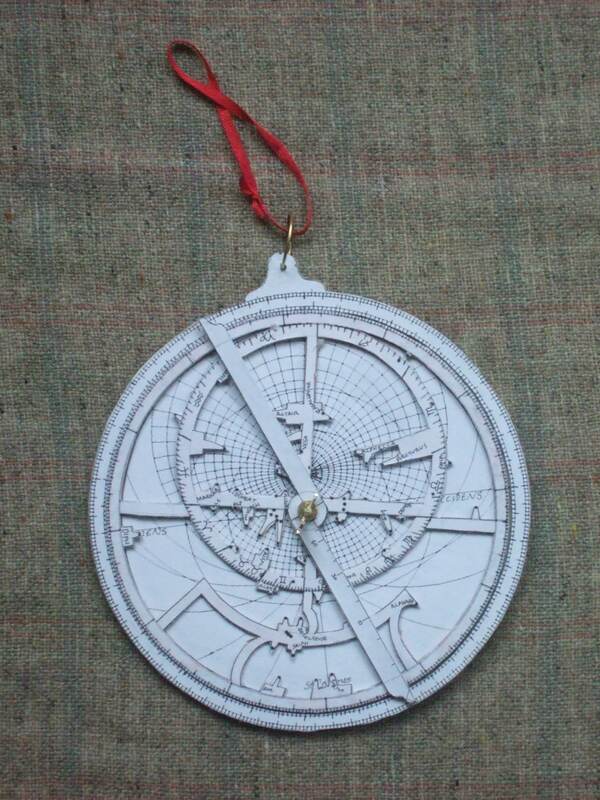 Also I ended up including all of the stars shown on Keith’s version – I have always struggled to recognise the isolated stars on classic astrolabe retes, but I think the patterns of the main constellations such as Orion or the Plough which are shown on my version should help with that. On the back of the mater I included a chart for the equation of time. I also included the shadow squares though I don’t really understand how they work! I am thinking that sine and cosine tables might have been more useful or interesting. Now I am thinking how it really ought to have a brass rule and adelaide. Perhaps I will try making them at some point in the future. 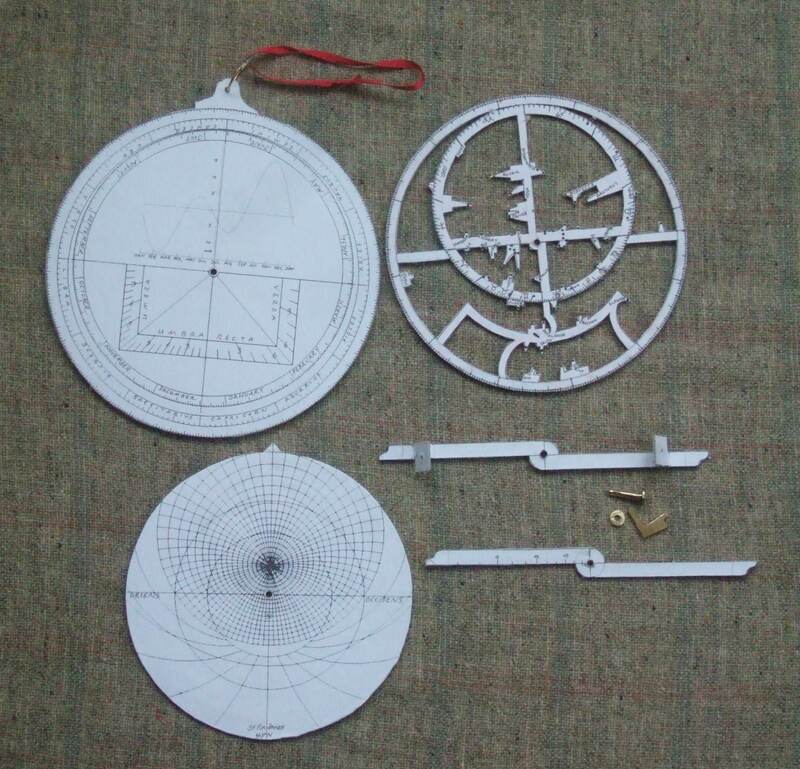 Is it worth considering making the other components in brass as well, or is that not worth the effort? This paper one is very handsome and works well enough!